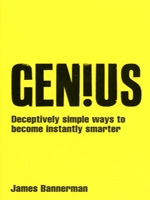 Genius shows you how to channel the life-changing principles of creativity to help you achieve more, succeed and become instantly smarter. This book delivers a fantastic array of simple, powerful techniques to help anybody be instantly ingenious and increasingly mentally skilful. You will learn to creatively solve problems, generate brilliantly original ideas, use clever tactics to persuade and influence and look for once in a lifetime opportunities to shine, succeed and really stand out.